It’s hard to believe we haven’t seen a No More Heroes entry since 2010, when No More Heroes 2: Desperate Struggle graced the Wii. The series skipped an entire generation of consoles and a follow-up had been long overdue. Although it’s not a traditional No More Heroes title, Travis Strikes Again: No More Heroes is the first original installment in nearly a decade and does a fine job of whetting your appetite until a full-blown sequel comes to fruition. After a dramatic cutscene in which you are briefly introduced to the tense history between Travis Touchdown and Badman, Travis Strikes Again throws you into the first segment of the game, which also serves as the tutorial. You eventually find out that you’re playing a game within a game. There are different worlds in which you must traverse and getting to them requires the use of game software known as Death Balls, which are compatible with the Death Drive MkⅡ – a retro video game system situated in Travis’ trailer, which also serves as the central hub. The hub and atmosphere combine to form an inviting concept that makes Travis a more relatable character; we all have our own place of comfort where we enjoy playing our games without any distractions, and Travis Strikes Again manages to replicate that notion. It’s also a relaxing setting, where you can casually change your clothes, learn more about your collectibles and even use the bathroom before jumping into chaos and heavy action sequences. Speaking of apparel, the majority of wearable shirts serve as fitting tributes to a wide variety of indie hits like Bit. Trip Runner, Hollow Knight, Dead Cells, Undertale, Golf Story and more with special designs that can be worn by both Travis and Badman. The game also includes a plethora of references to video game lore and pop culture that players who grew up in the 80s or 90s will appreciate. You’ll find allusions to established video game formulas, Superhero comics, classic movies, iconic singers, boy bands and much more. To top it all off, there’s an old man that pops up in several locations within stages to share some of his wisdom, which can also be applied to real life. The game features two playable characters – Travis and Badman – including support for two-player coop simultaneously, which works pretty well. Both of them share the same movesets and abilities can be swapped, so each one essentially offers the same experience. Aside from their potty mouths, they’re likeable protagonists for the most part. Travis is driven to continue his journey due to his love of video games, while Badman is determined to bring his daughter, Bad Girl, back to life. If you manage to collect all the Death Balls and conquer each game contained within them, you’ll have one wish granted. This particular idea is the driving force behind the story and makes you wonder whether resurrection is possible by a mere wish. There are six Death Balls for you collect. This is accomplished through searching for them in the adventure portion, where you read interactions between various characters in order for a story to envelop. Some of the scenarios are fun to watch, but many of them could feel like a drag depending on their length. They could go on for several minutes when all you want to do is dive into gameplay. Interactions are also brimming with expletives that Nintendo fans aren’t normally exposed to, so it would’ve been nice to have an option to tone them down, particularly around younger viewers or conservative folks. Similarly, the crude humor that the series is known for makes a comeback, but it’s not completely over the top. For example, toilets are still used to save your progress, but the nether regions are conveniently censored by a horizontal saving bar. The core gameplay is spread across all the games that are unlocked from the Death Balls. There are unique themes and objectives in each one, but the combat is largely the same. Travis is equipped with a handy weapon known as the Beam Katana, an electronic sword that can be swung repeatedly to take out weak enemies or struck forcibly to deal more damage on stronger foes. A lot of the combat is performed by executing repetitive hack-and-slash motions, but there is also variety to be found. There are rechargeable skills that you can learn along the way, such as dispatching powerful projectiles to shoot at foes or creating a restoration spot to heal your wounds. There are a number of diverse enemies and bosses that must be defeated in different ways, so you need to know which moves to use against each type. Apart from combat, basic platforming and puzzle elements exist like jumping to reach a higher location or rearranging terrain to reach your next target, but there isn’t much exploration throughout. The game is generally linear, sometimes too linear to the point where you can’t deviate much from the path, leaving you prone to an enemy’s unstoppable attack. This is incredibly apparent in certain areas, where a menacing enemy constantly follows you and doesn’t stop, and touching it will result in losing a life automatically. The linearity is emphasized due to how the camera is always fixed and cannot be manually adjusted. In addition, the game replicates a 4:3 aspect ratio by displaying status information on both ends of the screen. While this was done as a way to pay homage to TV of old, I would’ve preferred more of a widescreen and less-constrained display – especially in handheld mode. Despite setbacks with certain mechanics, difficulty is balanced overall. You can choose between three separate settings and, if you want, you can make things harder by refusing to level up your character or equipping certain skills. Travis Strikes Again: No More Heroes is not exactly the full-fledged sequel fans have been asking for, but it’s a step in the right direction and a sign of good things to come from Goichi Suda. With more than 10 hours of gameplay and further content planned via upcoming DLC updates, the game may very well keep you busy for a while. Another positive take that could be realized from the latest release: it’s a relief to know that Travis is back and he’s most likely here to stay. 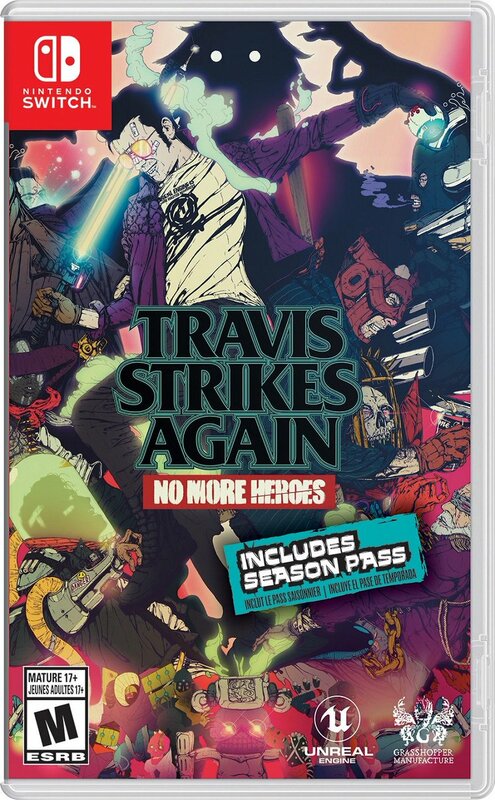 A review copy of Travis Strikes Again: No More Heroes on Nintendo Switch was provided by Nintendo UK. hm I think i’ll wait for the DLC to come out and then i’ll buy it. Did you know that you can get the free DLC once you buy the physical version? Troll??? … Why sorry eh? That’s just their opinion dude, chill. Not every person needs to like every game. I really like the boss battles in No More Heros 1 but hated the style and flair of these games. They make me roll my eyes so much. Ill be skipping this title cause I feel I can get worth out of something else whose style I appreciate more. The game is legit trash. I bought it, and played it through and it doesn’t hold a candle to the original NMH games. A real shame and an absolute cash grab. I mean, it looks and plays like a dodgy $8 indie game. Generic enemies, generic gameplay, poor storyline…….wish I hadn’t have bought it and supported such terrible development.